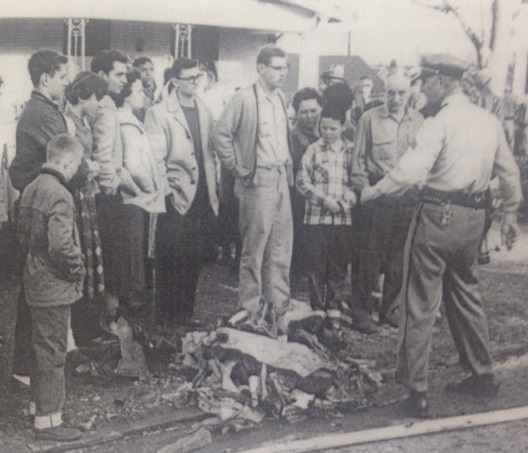 An LRPD officer talks to bystanders next to a piece of debrisThe peaceful morning of March 31, 1960, was interrupted by a horrendous noise over Hillcrest around 6:00am. A six-engine B47 from the Little Rock Air Force Base exploded mid-air. Flaming debris fell from Allsopp Park all the way to the State Capitol grounds and stretched from Cantrell to 12th Street. Other debris was found as far away as the Country Club of Little Rock. The next day the Arkansas Gazette ran a map which showed the extent of the damage. Three airmen died in the explosion. The only survivor from the crew, 1st Lieutenant Thomas Smoak, was found dangling from a tree in his parachute at Kavanaugh and Martin. He was treated by a nurse, Jimmye Lee Holeman, in whose yard he had landed. Two civilians on the ground were killed by falling debris. Many vehicles and homes were damaged, some were destroyed by debris. The damage estimate was put around $4 million. Police and fire crews were quickly on the scene to secure impacted areas, fight fires and rescue injured persons. Those who perished were Captain Herbert Aldridge, Lieutenant Colonel Reynolds Watson, Staff-Sergeant Kenneth Brose, and civilians Alta Lois Clark and James Hollabaugh. Today, a portion of the crash site is part of the Arkansas Children’s Hospital campus. Other sites were removed by the I-630 construction. Other houses were rebuilt or removed. While there may not be visible reminders of that fateful morning, to those who lost loved ones, there is still a sense of grief over their loss. It is a reminder that History is not just places, names, and dates: but events that happened to actual people. On March 2, 1819, the Arkansas Territory was created. It was carved out of the Missouri Territory (which itself had been carved out of the Louisiana Territory). The land consisted of what is now Arkansas as well as most of what is now Oklahoma. Today (March 1) from 9am to 1pm, the Department of Arkansas Heritage is leading events to commemorate the bicentennial of the establishment of the Arkansas Territory. These will take place on the second floor of the rotunda at the Arkansas State Capitol. At 10am, Governor Asa Hutchinson will make remarks. Throughout the commemoration there will be family-friendly activities and opportunities to learn about the history of Arkansas. Many of the divisions of the Department of Arkansas Heritage will be on hand. And, of course, there will be birthday cake! Today is the Martin Luther King Jr. Holiday. It is an apt time to think about Dr. King and Little Rock. A friend of L. C. and Daisy Bates, he attended the 1958 Central High School graduation to witness Ernest Green receiving a diploma. Each senior only received eight tickets to the ceremony at Quigley Stadium, and he was one of Green’s. Dr. King was in the state to address the Arkansas AM&N (now UAPB) graduation earlier in the day. His attendance was briefly mentioned in the local press, but there was no media photo of him at the ceremony. The Little Rock School District limited the press to one Democrat and one Gazette photographer. Other press were limited to the press box. There is a photo of Ernest Green with Daisy Bates and Dr. King (pictured on this entry). In 1968, when Dr. King was assassinated, Little Rock did not see the unrest that many cities did. Part of that was probably due to quick action by Governor Winthrop Rockefeller. The Governor released a statement fairly quickly expressing his sorrow at the tragedy and calling for a day of mourning. He also made the State Capitol available for the NAACP to have a public memorial, as well as worked with a group of ministers to host an interdenominational service. We in Little Rock are disturbed about the incident in Memphis. We are disturbed regardless of where it had happened. Killing is not the Christian solution to any of our problems today. In Little Rock, we feel we have come a long way in 10 years toward solving some of our problems of living and working together regardless of race, creed or color. The city Board of Directors in Little Rock has pledged itself toward continuing efforts to make Little Rock a better place in which to live and work for all our citizens. We feel the efforts of all thus far have proved we can live in harmony in Little Rock and are confident such an incident as has happened will not occur in Little Rock. We will continue our most earnest efforts toward the full needs of our citizens. The day after Dr. King was assassinated, a group of Philander Smith College students undertook a spontaneous walk to the nearby State Capitol, sang “We Shall Overcome” and then walked back to the campus. President Ernest T. Dixon, Jr., of the college then hosted a 90 minute prayer service in the Wesley Chapel on the campus. On the Sunday following Dr. King’s assassination, some churches featured messages about Dr. King. As it was part of Holy Week, the Catholic Bishop for the Diocese of Little Rock had instructed all priests to include messages about Dr. King in their homilies. Some protestant ministers did as well. The Arkansas Gazette noted that Dr. Dale Cowling of Second Baptist Church downtown (who had received many threats because of his pro-integration stance in 1957) had preached about Dr. King and his legacy that morning. That evening, Trinity Episcopal Cathedral was the site of an interdenominational service which featured Methodist Bishop Rev. Paul V. Galloway, Catholic Bishop Most Rev. Albert L. Fletcher, Episcopal Bishop Rt. Rev. Robert R. Brown, Rabbi E. E. Palnick of Temple B’Nai Israel, Gov. Rockefeller, Philander Smith President Dixon, and Rufus King Young of Bethel AME Church. We are gathered this afternoon to memorialize and pay tribute to a great American….To achieve equality of opportunity for all will require men of compassion and understanding on the one hand and men of reason and desire on the other. Mayor Borchert pledged City resources to strive for equality. Another Little Rock Mayor, Sharon Priest, participated in a ceremony 24 years after Dr. King’s assassination to rename High Street for Dr. King in January 1992. The name change had been approved in March 1991 to take effect in January 1992 in conjunction with activities celebrating Dr. King’s life. At the ceremony, Daisy Bates and Annie Abrams joined with other civil rights leaders and city officials to commemorate the name change. The Little Rock Culture Vulture debuted on Saturday, October 1, 2011, to kick off Arts & Humanities Month. The first feature was on the Arkansas Symphony Orchestra, which was kicking off its 2011-2012 season that evening. The program consisted of Mendelssohn’s Symphony No. 4 in A, Op. 90, Rossini’s, Overture to The Italian Girl in Algiers, Puccini’s Chrysanthemums and Respighi’s Pines of Rome. In addition to the orchestra musicians, there was an organ on stage for this concert. Since then, there have been 10,107 persons/places/things “tagged” in the blog. This is the 3,773rd entry. (The symmetry to the number is purely coincidental–or is it?) It has been viewed over 288,600 times, and over 400 readers have made comments. It is apparently also a reference on Wikipedia. The most popular pieces have been about Little Rock history and about people in Little Rock. Future Senator Joseph Taylor Robinson was born in Lonoke in August 26, 1872. In 1894 Robinson was elected to the Arkansas General Assembly for one term. From 1903 until 1913, he served in the US House of Representatives as a Congressman from Arkansas’ then-Sixth District. He chose not to seek another term in Congress and ran for Governor in 1912. On January 3, 1913, sitting US Senator Jeff Davis died in office. Robinson was sworn in as Governor on January 16, 1913. Twelve days later he was chosen by the Arkansas General Assembly to become the next US Senator. He became the final US Senator to be selected by a legislator instead of popular vote. At the time, Senate terms started in March, so Robinson served as governor until March 8, 1913. He rose through the ranks of the Senate and eventually became the first person to hold the title of Senate Majority Leader. In 1928, he was the Vice Presidential nominee for the Democratic Party. Four years later, he rode with Franklin and Eleanor Roosevelt to the inauguration ceremonies before FDR took the oath. He would be President Roosevelt’s go-to man on legislative issues. Senator Robinson died in Washington D.C. on July 14, 1937. His wife was in Little Rock making preparations for a trip the couple was to take. Following his demise, Mrs. Robinson went to Washington to accompany her husband’s body back to Arkansas. It was not until December 1937, that Senator Robinson’s name became attached to the municipal auditorium which Little Rock voters had approved in January 1937. Mrs. Robinson participated in the December 24, 1937, groundbreaking for the auditorium. Naming the auditorium after him was not Little Rock’s first attempt at honoring Senator Robinson. In 1930, portions of Lincoln, Q, and Cantrell streets were renamed Robinson Drive in his honor. This was part of an effort to give Highway 10 (which had four different names as it wended through the City) a single name in Little Rock. A few months later the Senator requested that the original names be returned. Cantrell had been named in honor of a developer who was continuing to work in the area surrounding that street. The Senator felt it should be named after Mr. Cantrell. As part of that, the name Cantrell was extended to most of Highway 10 within the Little Rock city limits. In 1935, on Senator Robinson’s ante-penultimate birthday, the Little Rock City Council coincidentally approved the plans for a municipal auditorium which would then be submitted to the Public Works Administration. It was this project which would become Robinson Auditorium. As has been noted in a previous post, War Memorial Stadium was approved by the Arkansas General Assembly in March 1947. The work then began on the finalization of the location. Four cities were in the running: Little Rock, North Little Rock, Hot Springs, and West Memphis. Each of the cities was required to donate the land for the stadium, provide parking for it, and sell local subscriptions equivalent to $250,000 to raise money for it as well. On May 19, 1947, the City Council approved Resolution 1,747 to donate the land for the stadium in Fair Park if Little Rock was selected. This was not the first mention of a stadium in City records. In March of 1947, the City Council had set aside land in Fair Park to use for a playground — with the stipulation that if it was eventually needed for a stadium, it would be relinquished for that purpose. Instead of meeting in a usual committee room, the meeting was held in the House Chambers of the State Capitol. The location for the meeting had been set because a large crowd was expected. And the attendance did not disappoint. City government and business leaders from all three cities turned out in full force. The members of the Commission were Ed Keith, Chairman, Magnolia; Gordon Campbell, Secretary, Little Rock; Ed Gordon, Morrilton; Senator Lee Reaves, Hermitage; Senator Guy “Mutt” Jones, Conway; Dallas Dalton, Arkadelphia; Judge Maupin Cummings, Fayetteville; Dave Laney, Osceola; and Leslie Speck, Frenchman’s Bayou. For several hours the nine heard proposals from the three cities. Little Rock’s location was in Fair Park, North Little Rock’s was near its high school, and Hot Springs was on land next to Highway 70 approximately 2.5 miles from downtown. Finally it was time to vote. After two rounds of voting, Little Rock was declared the winner on a weighted ballot. Though ground was broken later in the year, by December 1947, the stadium was still $250,000 shy of funding for the construction. This was after the state and Little Rock had previously both upped their commitments to $500,000 each. The building did eventually open on schedule in conjunction with the 1948 Arkansas Razorback football games. As for Mayor Ricks of Hot Springs, he moved to Little Rock to serve as Adjutant General of the Arkansas National Guard during the governorship of Sid McMath. He later held leadership positions in the National Guard Bureau in Washington DC. He died in 1954 at the age of 45. Among the ways he was memorialized was a National Guard armory in Little Rock, which stood in the shadow of War Memorial Stadium. Eighty-one years ago today, on July 14, 1937, U.S. Senator Joseph Taylor Robinson died in his apartment in Washington D.C. The Senator’s wife, Ewilda, was in Little Rock making preparations for a trip the couple was to take. (She was informed of her husband’s death when her sister-in-law called to express condolences. No one had yet notified her of her husband’s demise.) Following the news, Mrs. Robinson went to Washington to accompany her husband’s body back to Arkansas. As the Senate Majority Leader, Senator Robinson was usually President Franklin Roosevelt’s point person to shepherd legislation on Capitol Hill. The Democrat’s 1928 Vice Presidential nominee, Senator Robinson was particularly close to FDR. He had successfully steered numerous pieces of New Deal legislation through Congress. However, at the time of his death, the Senator was facing an uphill climb trying to build consensus on the President’s unpopular Court Packing scheme. The Senator was honored with a memorial service in the Senate chambers on Friday, July 17. President Roosevelt and the cabinet joined members of the senate on the floor in what was described as a state funeral without pomp. Mrs. Robinson sat with her brothers and two nephews as well as Bernard Baruch and Arkansas Power & Light’s Harvey Couch, who were Senator Robinson’s closest friends. Eleanor Roosevelt was one of the many crowded in the senate galleries observing the service. Following the service his body remained in the chambers until it was transferred to a train to make the journey to Little Rock. A sealed mailer containing bound copy of remarks delivered at Sen. Robinson memorial. It bears the franking signature of Sen. Hattie Caraway. The funeral train bore his body, his family, 50 senators and over twenty congressmen. It reached Little Rock around 8am on Sunday the 19th. From there, Senator Robinson’s body was taken to his house on Broadway Street until noon. It subsequently lay in state at the Arkansas State Capitol until being escorted by military to First Methodist Church. 1,500 people packed the church a half hour before the service began. The sun shone through the windows onto the flag-draped coffin as Rev. H. Bascom Watts led the service. Among the pallbearers was former Vice President Charles G. Dawes. Governor Carl Bailey of Arkansas was joined by Governors Richard Leche of Louisiana and E.W. Marland of Oklahoma. As the funeral procession reached Roselawn Cemetery, thunder echoed. The skies which had alternated between sun and rain that day, returned to rain. A deluge greeted the end of the service and sent visitors hurrying for shelter at the end.